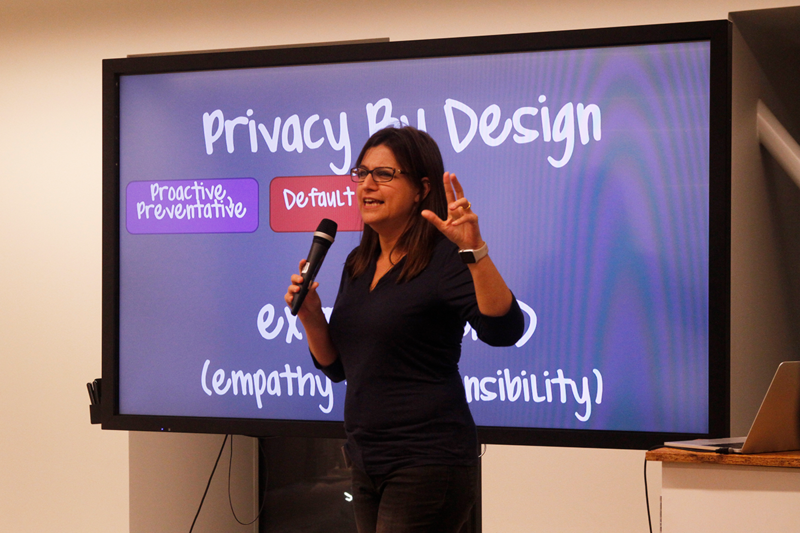 Shuli Gilutz presents at the talkoot on Privacy by Design and its role in design and development processes. 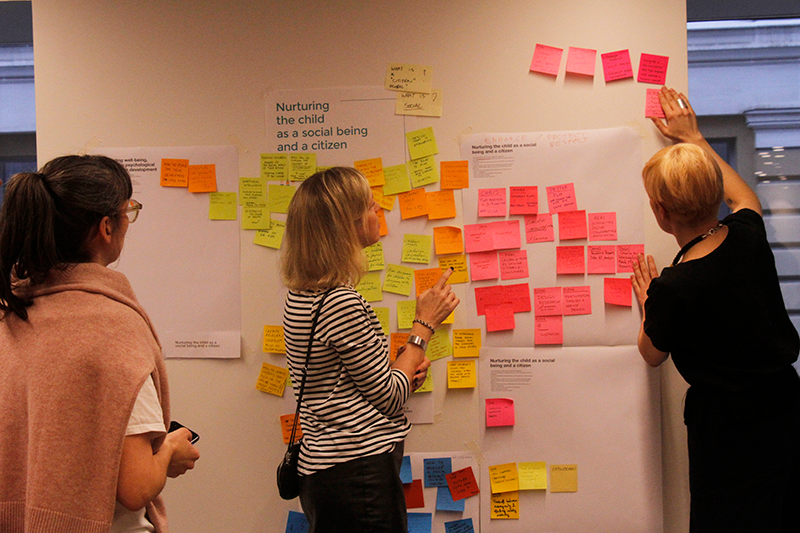 (25 January 2018) A group of designers, researchers, psychologists, and experts on children’s rights and protection convened recently in Helsinki, Finland during a 48-hour talkoot* event with the aim to create an open and free digital guide to integrate children’s rights into the design process for products used by children. The 48-hour event, co-hosted by UNICEF Finland and Elisa, took place 19-21 January 2018. Researchers and usability designers from around the world were invited to present on child privacy and digital rights and to work together to create a set of principles in the form of a guide for ethical design for children’s rights. Because technological innovations and media have provided children with unprecedented opportunities to express themselves, access information, learn, share, play, and communicate, the talkoot set forth an ambitious agenda aiming to address the increased exposure to risks that may compromise children’s well-being, through better design. Recognizing that exposure to age-inappropriate content or violations of children’s data privacy have become challenges for children’s rights in today’s world, the goal of the talkoot was to provide guidance to design products in a way that minimizes the risks while maximizing the benefits for children. The event aimed for guidelines that would integrate children’s rights into the design of new products and services from the very beginning. Read more detail on these principles and other ideas to emerge from the talkoot here. 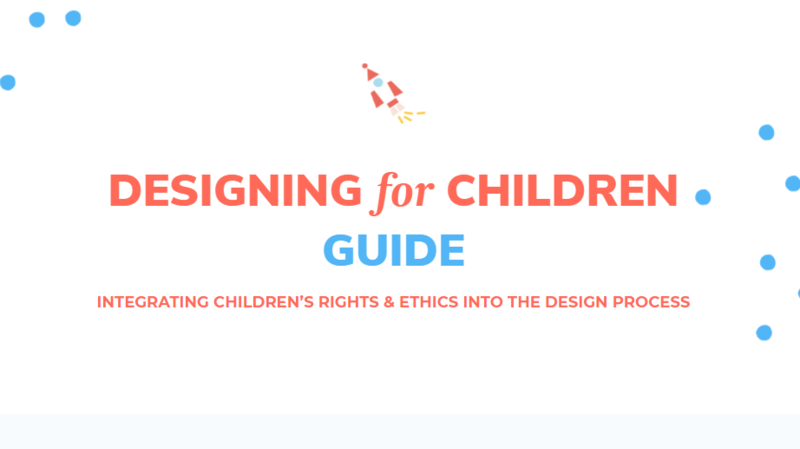 The resulting Design Guide consists of a set of key principles written from the perspective of children as consumers to designers of products for them. The principles ask designers to consider different needs and scenarios from the perspective of a child user. The idea for the event came originally from the company Elisa, Finland’s largest mobile operator and main sponsor of the talkoot. Elisa’s designers tested UNICEF’s Child Online Safety Assessment tool and suggested to complement the tool with a guide that gives more specific and detailed support for designers of toys, games, and programmes for children, and to integrate child rights considerations into their design process. 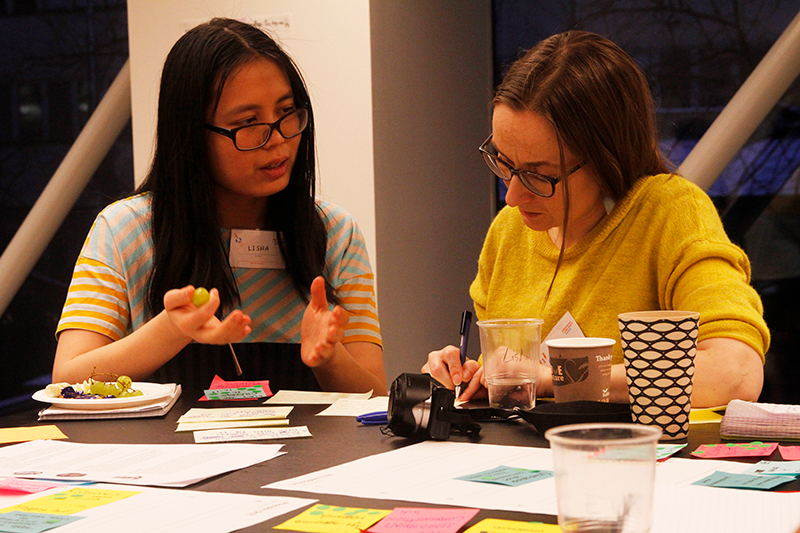 Elisa invited UNICEF to bring in expertise on child rights as a co-organizer of the workshop to work with designers, researchers, and other experts to raise awareness of child rights issues among the designer community and help develop a guide to fill the gaps in the design process. According to Irene Leino, Corporate Responsibility Advisor for UNICEF Finland, “one of our strategic goals is to get companies to respect and support children’s rights in their business. We’ve come to realize that the general level message on Children’s Rights and Business Principles does not easily translate into action, as it’s quite high-level policy advice, and doesn’t provide concrete guidance and recommendations to specific industry sectors.” “So we decided to try a new approach where we talk to the ‘doers’ – designers of digital products – directly and get them involved to think about what child rights would mean in their work. They are the best experts of their own work and through dialogue and co-creation we can both learn from each other and do something together,” Leino added. UNICEF Innocenti’s Daniel Kardefelt-Winther presents at the Children's Design Guide talkoot. Daniel Kardefelt-Winther, UNICEF Innocenti’s expert on digital technology and child rights, was invited to present recent research from UNICEF’s Global Kids Online programme, to inform designers about pressing child online protection challenges that could be met by designing with children’s rights in mind. Kardefelt-Winther noted a specific design challenge wherein children are exposed to violent or age-inappropriate content online when using new technology platforms that, for example, show users videos with similar titles and tags in succession, without any awareness of the user or the kinds of content that is eventually displayed to them. 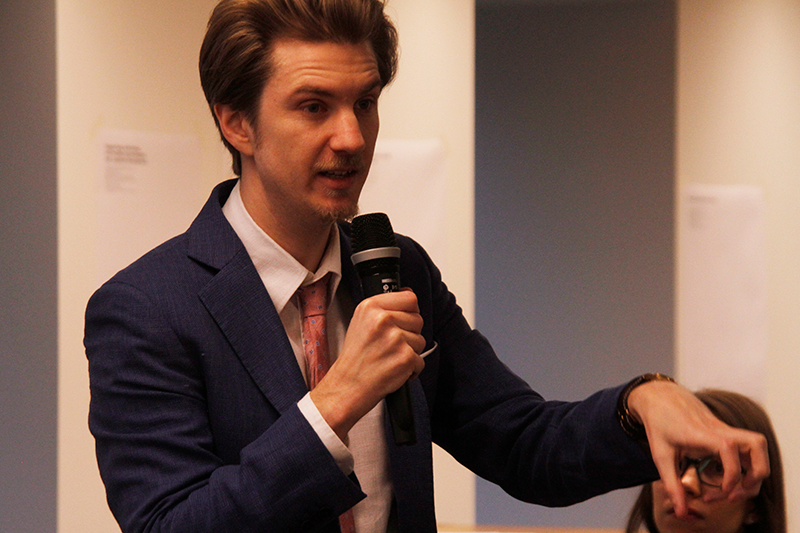 “It’s important to consider how we can design from a child rights perspective because policy solutions sometimes take a long time to implement and evaluate, so by the time policy is implemented, technology has moved on and is no longer applicable,” Kardefelt-Winther said. “So, if you can encourage designers to design products that are child-rights compliant from the beginning, you can avoid some of the issues that we would otherwise need policy solutions for later on – it’s a preventative approach that can complement the policy approach well,” Kardefelt-Winther added. Participants brainstorm at the Children's Design Guide talkoot in Helsinki. What’s next after the initial development of the Design Guide principles? According to Leino, the talkoot “was such a great experience that we’ll explore possibilities to organize similar co-creation events in other contexts – perhaps other sectors, other target groups – in the future.” The participants of the talkoot have agreed to edit and improve the existing principles to shape them into something more formal. They also aim to create an online community to allow designers, researchers, and others to continue collaborating in this space. We live in an information society, where the flow of information in the virtual environment is unprecedented. Web 2.0 platforms – and recently Web 3.0 platforms and the Internet of Things (IoT) – represent an important step forward in enhancing the lives of both adults and children everywhere, by combining greater efficiencies with a wide availability of new tools that can boost individual creativity and collective production. This new environment has exposed adults and children to fresh challenges that deserve special attention, especially those surrounding privacy. The main objective of this paper is to address the challenges posed to child privacy online and the impact that these challenges might have on other rights such as freedom of expression, access to information and public participation. To do this, the paper first analyses the current (and foreseen) threats to child privacy online and the various approaches adopted by government and/or the private sector to tackle this issue. The paper also examines whether children’s perspectives and needs are considered in international debates on technology regulation, including in regard to the so-called ‘right to be forgotten’. It then contextualizes the protection of privacy (and data protection) in relation to other fundamental rights in the online environment, arguing that in most cases this interaction is rather positive, with the enforcement of the right to privacy serving to protect other rights. The paper concludes by proposing some policy recommendations on how to better address the protection of children’s online privacy. These objectives are achieved through literature review and analysis of legal instruments. Based on an evidence-focused literature review, the first part of this paper examines existing knowledge on how the time children spend using digital technology impacts their well-being across three dimensions; mental/psychological, social and physical. The evidence reviewed here is largely inconclusive with respect to impact on children’s physical activity, but indicates that digital technology seems to be beneficial for children’s social relationships. In terms of impact on children’s mental well-being, the most robust studies suggest that the relationship is U-shaped, where no use and excessive use can have a small negative impact on mental well-being, while moderate use can have a small positive impact. In the second part of the paper, the hypothetical idea of addiction to technology is introduced and scrutinized. This is followed by an overview of the hypothetical idea that digital technology might re-wire or hijack children’s brains; an assumption that is challenged by recent neuroscience evidence. In conclusion, considerable methodological limitations exist across the spectrum of research on the impact of digital technology on child well-being, including the majority of the studies on time use reviewed here, and those studies concerned with clinical or brain impacts. This prompts reconsideration of how research in this area is conducted. Finally, recommendations for strengthening research practices are offered. The international community has recognized the importance of internet access for development, economic growth and the realization of civil rights and is actively seeking ways to ensure universal internet access to all segments of society. Children should be an important part of this process, not only because they represent a substantial percentage of internet users but also because they play an important part in shaping the internet.